But was it religiously successful? Are the reconstructed churches truthful recreations of the ecclesiastical and liturgical space? In the last months of the second World War, the Nazis deliberately destroyed the city of Warsaw as a punishment for the uprising of 1944. They targeted its built heritage. They destroyed an estimated ninety percent of all historic buildings, including churches. Notable Catholic churches were detonated such as Saint John’s Archcathedral and the adjacent Jesuit church, most of the historic churches in the Old Town, as well as the Church of the Holy Cross, Saint Florian in Praga and Saint Alexander in Three Crosses Square. During the years of Communism many churches, monasteries and convents behind the Iron Curtain were intentionally neglected or pulled down. Many socialist states after the second World War implemented the ideals of a socialist capital: to design a new city for a new society. This was a society which no longer had a need for places of worship, other than as monuments to an era gone by. These socialist states promoted secularization in the way they treated churches. In East Berlin, capital of the former Communist German Democratic Republic, the state erased churches from visual memory as part of constructing the socialist city. Either they were obscured from view by placing modern structures in front of them, as was done with Karl Friedrich Schinkel’s Friedrichswerdersche Church, or they were pulled down, as was done with the eighteenth-century Trinity Church and a dozen others. 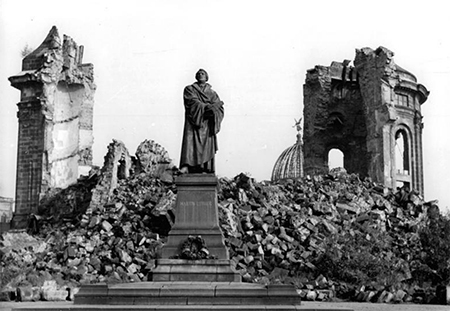 For decades the Lutheran cathedral stood as a damaged relic next to the Palace of the Republic, overlooked by the Fernsehturm, symbolic for the ruined state of religion in the socialist state. Restoration of this church began in 1975, and was only reopened as a place of worship after the re-unification of Germany in the 1990s. In Poland, however, the socialist regime surprisingly chose to reconstruct Warsaw’s war-damaged historic center soon after the end of the second World War. Other Central and Eastern European countries started doing this at a more recent date. The German reconstruction of the Frauenkirche in Dresden, recreating the famous views by Canaletto of the royal capital of Saxony, is a striking example. In the 1990s, restoring this domed church became a symbol for German re-unification. 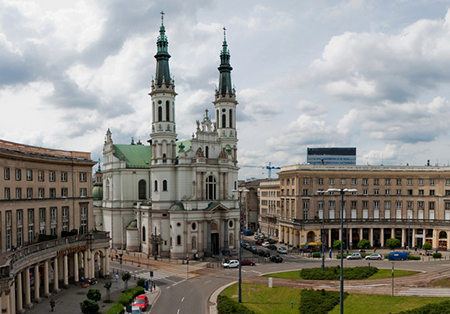 Rebuilding in Warsaw started in the early years after the second World War. The recently returned paintings by Bellotto depicting the royal capital in the late eighteenth century were legendarily used as a guide. Now, at various locations in the historic city, paintings by Bellotto are reproduced on site, to illustrate the resemblance between contemporary Warsaw and the royal city during the age of the Enlightenment. Bernardo Bellotto (1721-1780), or Canaletto the Second, was asked to the royal court in Warsaw by Stanislas Poniatowski (1732-1798), who had recently been elected king of the Polish-Lithuanian Commonwealth. For decades the de facto cultural center and residence of the kings had been Dresden. After Poniatowski’s election in 1764, Warsaw regained its position as center of the Commonwealth. As court painter, Bellotto captured the vivacity of the royal capital in his encyclopaedic depictions. 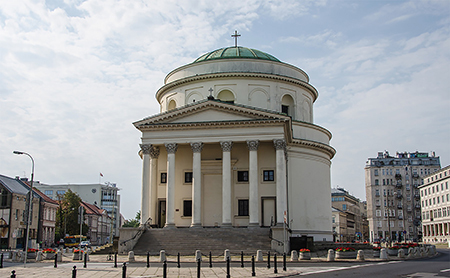 During this period, the appearance of Warsaw changed as buildings were constructed or renovated in the advanced architectural theory of the period, a neoclassicism inspired by French architectural theorists and ultimately by the Italian Andrea Palladio. In 1753 Abbot Marc-Antoine Laugier published the Essai sur l’Architecture. The abbot, sometimes called the first modern architectural philosopher, advocated moving architecture away from retained disorder by using the principles of order. Antoine Quatremère de Quincy, who contributed volumes on architecture to the Encyclopédie Méthodique, described Palladio as “the maker of rules by which architecture should be played” and elevated his classicism to model status. These French publications of architectural theory became eighteenth-century guides for constructing good architecture. 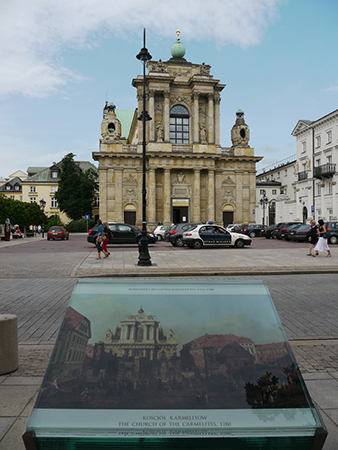 The remodeling of churches on the Royal Route, the roads connecting the Royal Castle in Old Town and the royal villas to the south at Wilanow, shows this understanding of Classicism had been introduced in Warsaw. The new façade for the Church of the Discalced Carmelites, designed by Efraim Szreger and built between 1761 and 1762, illustrates their knowledge of the works by Ange-Jacques Gabriel, Louis XV’s main architect, and Jacques-François Blondel, a professor at the Académie Royale d’Architecture. In 1786, a new entrance building was begun for the Bernardine church of Saint Anne, a medieval foundation that was largely rebuilt in the sixteenth and seventeenth centuries. The project shows understanding of the French guidebooks. It was begun under Ignacy Potocki (1750-1809), an author of the 1791 Constitution and of an influential treatise on architecture which argued that architecture conveys a culture’s values and could be used to better the nation, and was completed by Piotr Aigner (1756-1841), another prominent neoclassical theorist. The façade is often regarded as the finest example of ecclesiastical Palladianism in Poland. It is a temple front with engaged columns and can be compared to the Church of Santa Maria Nova in Vicenza, Italy, which is attributed to Andrea Palladio in 1578. As in Palladio’s examples the façade has no windows. The new front of Saint Anne’s is partly the result of royal patronage, as the four evangelists adorning the façade were donated by King Stanislas. The temple front identifies the building as a place of worship. However, the front, a composition of strong and recognizable motives, is not part of the building. It is part of the street. Behind the neoclassical curtain hides an interior in a central European tradition, a baroque space unrelated to the Palladian forms of the front. What happens behind the façade almost remains secondary. The buildings are part of the scenery, as in a Bellotto painting, placed in an urban scenography. Saint Anne’s temple front is part of the street, intended to bring classic order to a chaotic place as Abbot Laugier prescribed. A second church by Aigner which was reconstructed after the war illustrates that the narrative should be understood as a spiritual rather than a material renovation alone. 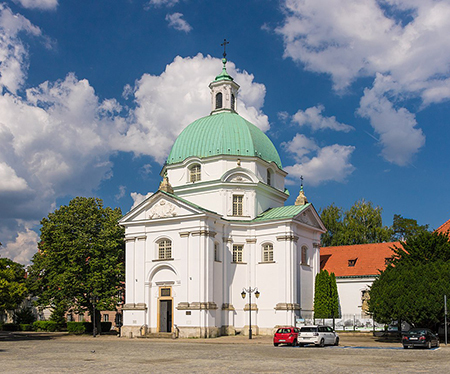 Located on the Royal Route, Saint Alexander’s Church in Three Crosses Square was dynamited in 1944. A purist piece of architecture, this church is one of the finest attempts to represent the Pantheon as a Catholic church. 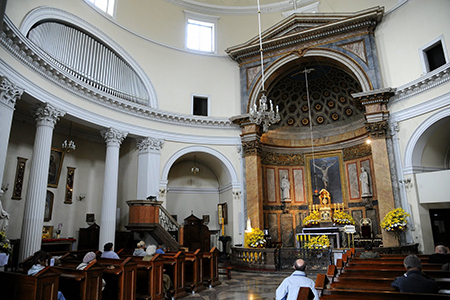 Centrally planned parish churches expose the difficulty of uniting a centrally planned space with the Catholic liturgy. 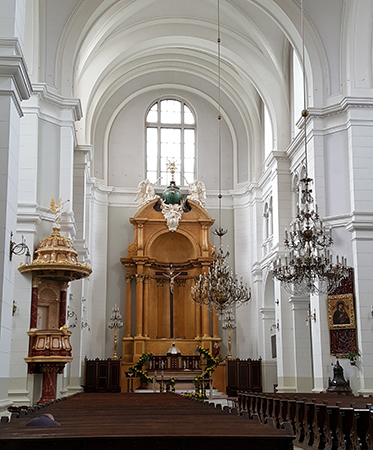 An example of this is the Cathedral of Saint Hedwig in Berlin, an eighteenth-century evocation of the Roman Pantheon, where the celebration of the sacred liturgy remains troublesome. Aigner tried to solve the problem by designing the chancel as a second portico. Approached on the Royal Route from both the north or the south, the church appears as a representation of the Pantheon, with temple fronts on two sides. The church is placed in Three Crosses Square as Hawksmoor positioned his Mausoleum in the grounds of Castle Howard, England, carefully composing a scene. The church was begun in 1818 and finished some years later. It was restyled and extended in 1886-1894, in a neo-Renaissance style typical of the period. The post-war reconstruction, however, returned to Aigner’s original design. This was a symbolic decision emphasizing what the neoclassical Saint Alexander’s Church represents—a built commemoration of the first Constitution. 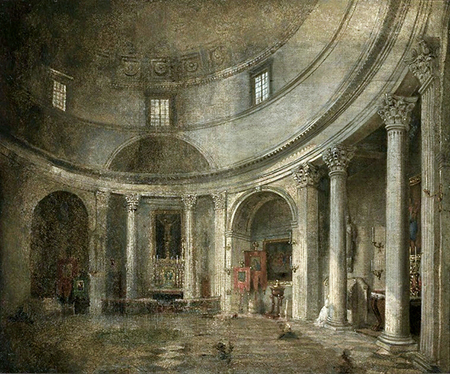 An anonymous painting of the original sacred space shows a refined neoclassical interior, yet today that balanced interior has been completely transformed by the addition of a large apse in the style of the Pantheon in Rome. As a reconstruction, the rebuilt version of this interior is deficient. Other reconstructed churches in Warsaw display a similar deficiency. The exteriors are copies of the original, yet the interiors are lacking the richness and details of altar pieces and the display of chandeliers and sacred images they had before the war. 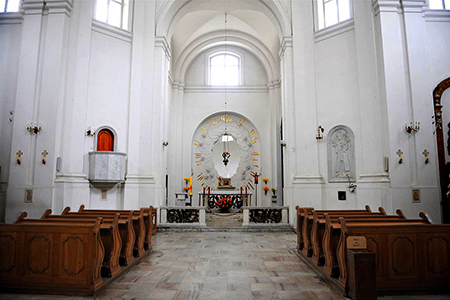 Examples in Old Warsaw of simplified ecclesiastical spaces include Saint Francis’, Saint Martin’s and Saint Casimir’s. 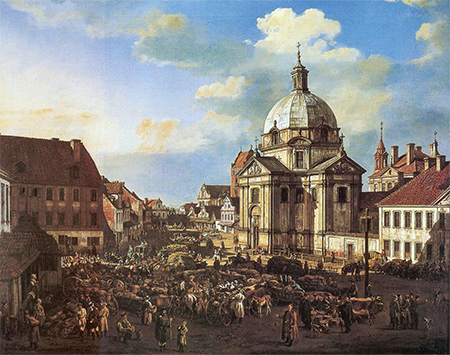 The latter is depicted in Bellotto’s painting of New Town Market Square (1778), a fine baroque church by Tylman Gamerski (1632-1706). The basic white interior of today is shockingly unsatisfying. 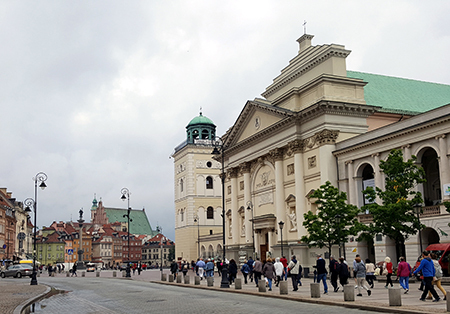 The church of the Holiest Savior, dominating the lively eponymous square, is located in the southern center of Warsaw. Its two slender towers can be seen from Constitution Square, constructed during the socialist era. The Lady Chapel is an imitation of a Marian chapel at the Wawel Cathedral in Krakow and contains a sacred image which was honored by Pope John Paul II in 1999. As in other churches in Warsaw during the second World War, notably the church of All Saints, the people of Holiest Savior helped Jews survive. In 1939, German bombing damaged the roof and towers. In 1944, following the Warsaw Uprising, the Germans dynamited the church, destroying much of the building, including the main altar, the pulpit, and the large chandeliers. Renovation started rapidly after the war, by removing the rubble and making the church ready for worship. Already in 1948 the building could be reopened as a place of worship. Wieslaw Konowicz was the restoration architect. The government allowed rebuilding the towers some years later. In other socialist capitals, the state pulled down church towers and erased them from visual memory, such as the tall spires of East Berlin’s Saint Peter’s and Saint George’s churches. Today Holiest Savior is a flourishing house of worship. Its chapels are used for private contemplation and the church is regularly used for celebrating Mass. It is a living place, of which the renewal of the floral compositions which adorn the altars are a living witness. Without a regular celebration of Mass the ecclesiastical space becomes empty, a meaningless relic of the past. Whereas a continuity in purpose makes the church a sacred building. Churches are the containers of many values. They can have multiple meanings, ranging from the historical to the symbolic, from the associational to the aesthetic. The most significant meaning, however, is the religious value that sacred architecture embodies. The ecclesiastical space of some churches in Warsaw may seem unsatisfying. Conventional preservationists may even argue these interiors are failed reconstructions of the original. The reconstruction of some church interiors, while not exact replications of the originals, are, however, truthful renovations of the ecclesiastical and liturgical space. They are living places of worship, where Mass is celebrated and the altars are ornamented by floral compositions. Renovating churches is continuity in purpose. Past generations have adapted churches, altered the appearance by adding new façades as was done with the Bernardine church of Saint Anne and the church of Discalced Carmelites. Future generations may decide to adorn their churches, adding sacred images or installing an improved organ, to retain the continuity of a religious building and to continue in the tradition of sacred architecture.